Gundam Sandrock, also known as the Desert Gundam, is the pride and joy of Quatre Raberba Winner. Quatre almost seems to have a human understanding and affection for his Gundam, often referring to it as "Boku no Sandrock" - my Sandrock. Having the appearance of a knight of the desert, Sandrock operates most efficiently on land, being a land-based Gundam, and is the mostly heavily armored Gundam to appear in the series. Wielding twin Heat Shorters, or scimitars, which glow red when ready to strike, Sandrock can quickly and effectively cut through the titanium alloy of the OZ Mobile Suits, sometimes numerous suits with a single swipe. 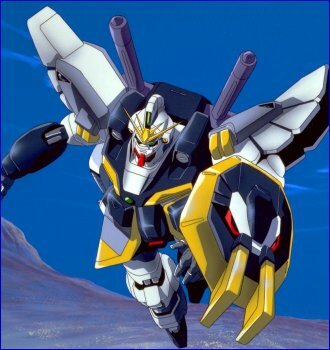 However, as with Gundam Deathscythe, Gundam Sandrock was destroyed in the mid-point of the series in the midst of battle with OZ Mobile Suits and to protect Duo as he waited for him in a shuttle. When all had seemed hopeless, Quatre had thumbed his self-destruction switch, intending to go down with his Gundam. However, due to an affection Instructor H, the creator of Sandrock, had for the blonde Arabian, Sandrock's hatch was opened and Quatre dropped out and got to safety before Sandrock was blown to pieces, eliminating all Mobile Suits within range. Unlike Deathscythe, Gundam Sandrock was reconstructed and given back to Quatre so that he could continue fighting after his construction of Wing Gundam ZERO (and his temporary bout of insanity ^^;). As a result of Quatre's high status as the Winner heir, Sandrock is the only Gundam that fights with a contigent of Mobile Suits behind it. Forty to be exact. Forty of Quatre's bodyguards that bow to Quatre's every whim and request, piloting one Mobile Suit Maganac each.